And is it still there? 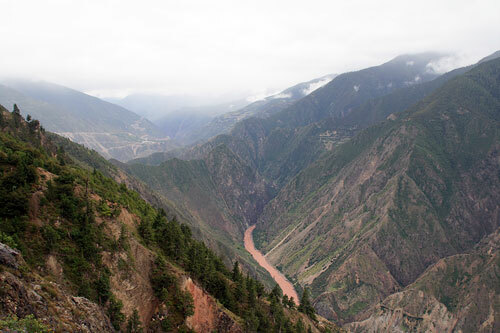 Having just read a devastating article about the future of Cizhong due to the Damming of the Mekong River (No Recourse: Upper Mekong Dam Spells End for Tibetan Village), we decided to publish this review from our diary that we had never previously put up on the blog. The Road from Feilai Si near Deqin winds its way to the bottom of the Langcang Valley (Mekong River Valley) in a series of dramatic hairpin bends. 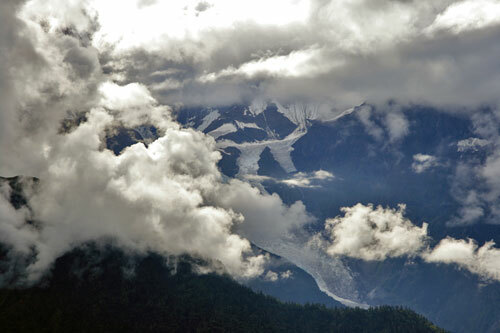 On the right the mystical mountain of Meili Xueshan teases and torments the traveller with rare glimpses of its summit and glaciers in a game of hide and seek in the monsoon summer months. For one second it’s there in all its majestic glory and then the next it’s gone, hidden behind swirling clouds or an impenetrable mist. 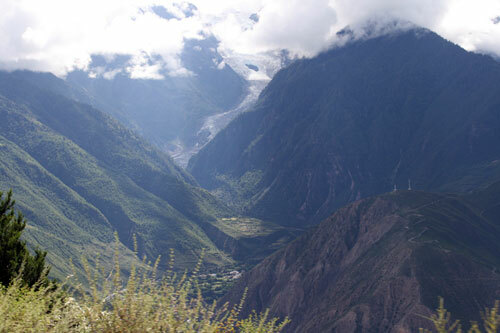 As the road reaches the river at the bottom of the valley, the barren rock faces on the left that threatened to come crashing down on our puny vehicle give way to fertile green fields dotted by white villages and prayer flags. 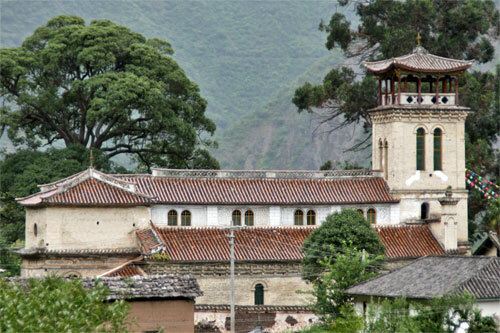 Welcome to one of the most romantic places in China; the tiny village of Cizhong in China’s South West Yunnan province. 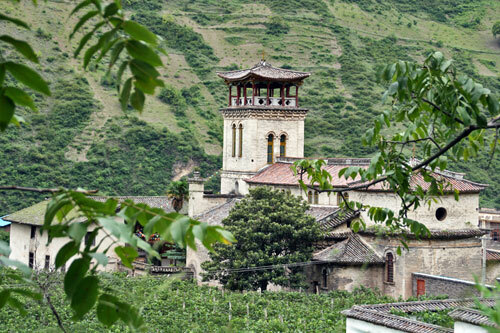 While there are many other beautiful villages in the area, Cizhong stands out because of the lovely Catholic church that dominates the centre of the village and its surrounding vineyards. The church was built by French missionaries nearly a hundred years ago in a vaguely Gothic style, topped by a three- storey clock tower. 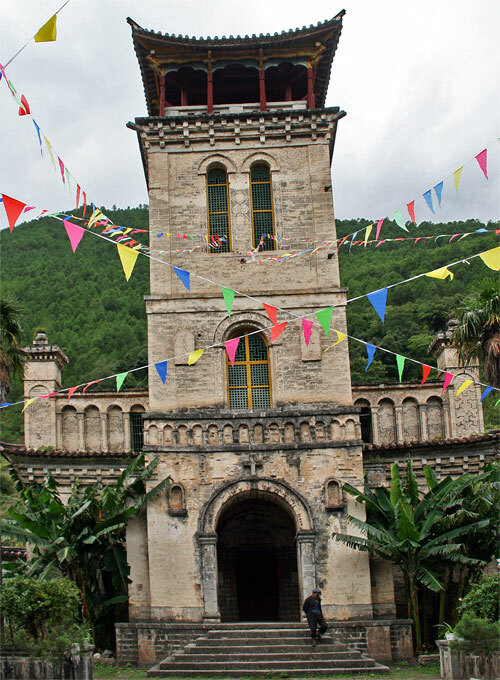 Local influences such as the eaved roofs and glazed tiles that were incorporated into the structure, as well as the palm trees flanking its main entrance, lend it a distinctively exotic appearance. The views from the top of the tower over the village and the mountains are dazzling. 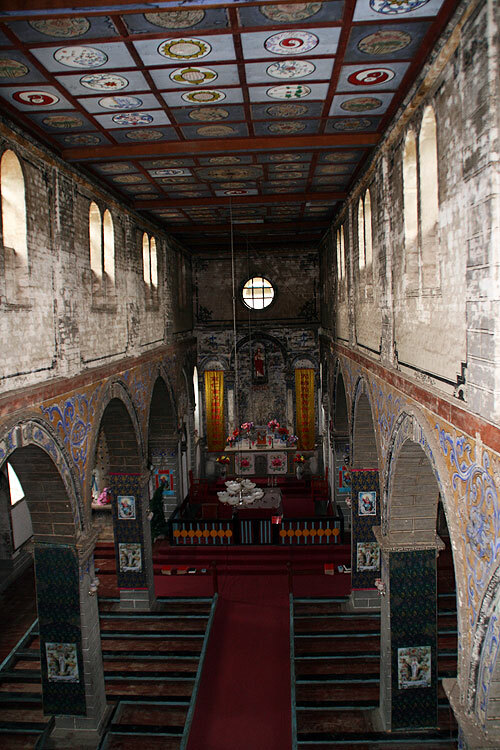 Inside, the church is quite austere, but for its ceiling which is painted in different shades of blue and decorated with a mixture of floral and Taoist motifs. 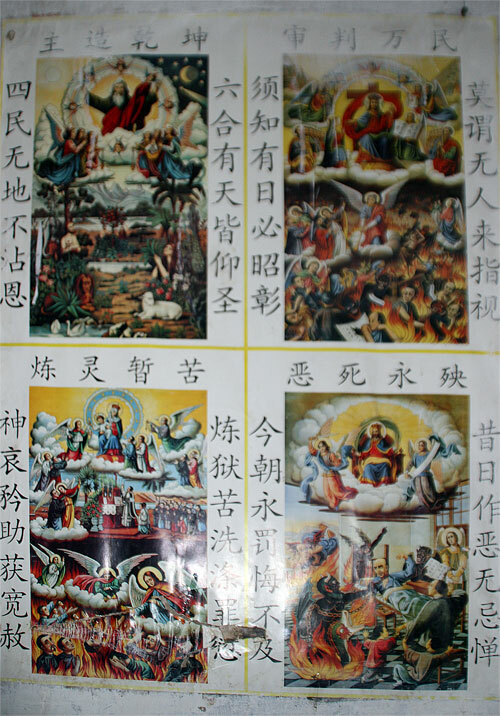 Naive paintings showing the different stages of the Way of the Cross hang from the walls with Chinese characters underneath, telling the story. 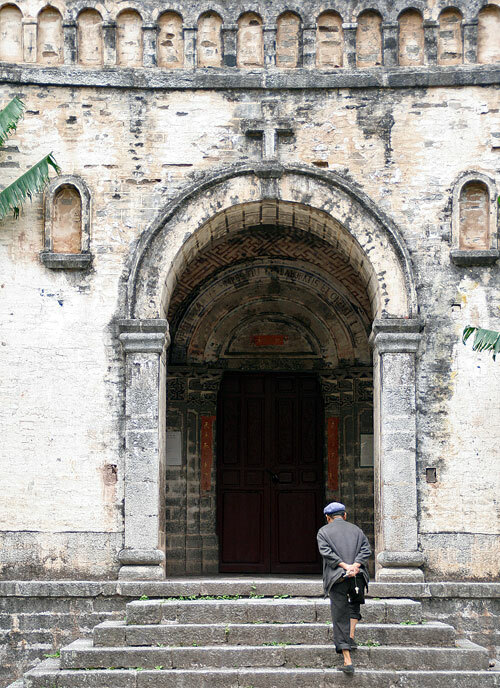 The church benches, which are raised no more than 20 centimetres from the floor, are uncomfortably low for Westerners, unused to squatting, and the sight of the prayer books in Chinese lining them seems incongruous to our eyes. 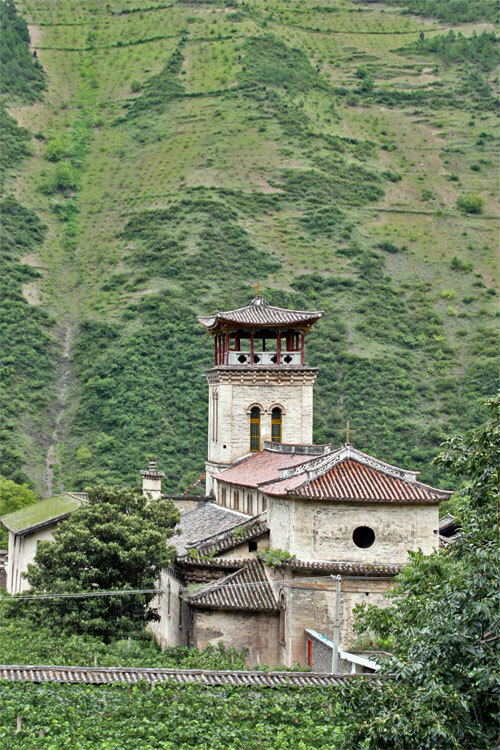 With its church dominating the village you might think that Cizhong is a uniquely Christian village. However, nothing could be further from the truth. 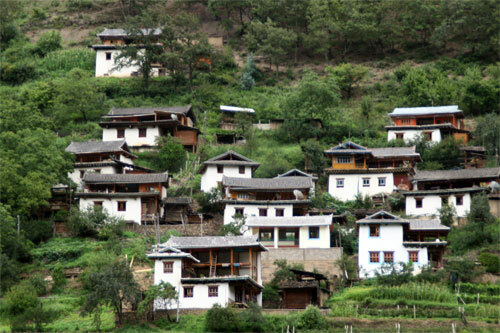 The village is made up of Christians and Buddhists and various ethnic minorities including Lisu (傈僳族), Yi (彝族) and Tibetan (藏族). It seems difficult to get a consensus as to whether there are more of one or the other, or whether the village population is evenly split. The family with whom we had lunch claimed that Cizhong was divided 50/50 and that included them as well, since the husband was Christian and his wife Buddhist. Relations between both communities were obviously good, evidenced by the fact that both groups share each others festivals. For those who wish to explore further, there are numerous stone paths leading out of the village towards the mountains or to other villages that offer great hiking possibilities. 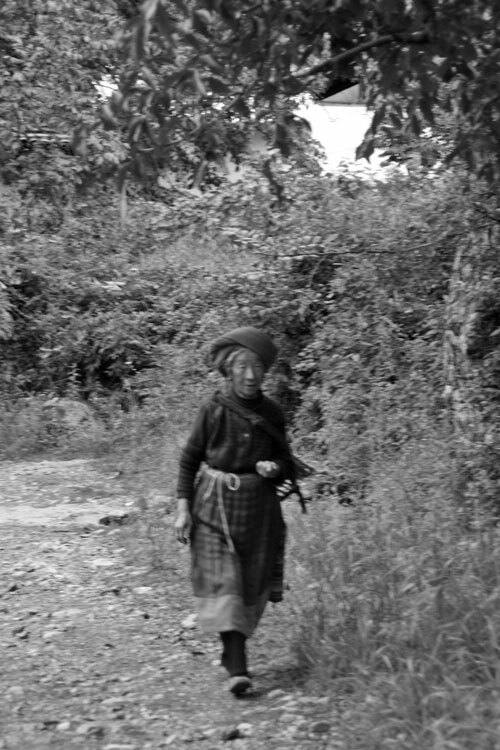 On your way you’ll pass locals picking fruit or harvesting their crops, which at the moment are the main sources of livelihood for the villagers. 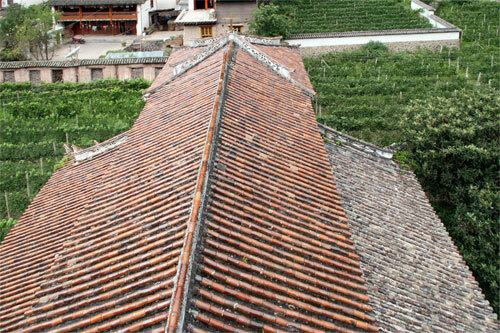 Wine production and a budding tourist industry promise a more prosperous future for Cizhong’s residents. Apart from its natural beauty, Cizhong has an added bonus. Wine. And plenty of it. The missionaries originally planted the vines in order to have wine for Mass. The locals have kept up the tradition and many house in the village openly sell it. The actual wine produced and sold in Cizhong is certainly not your classic Burgundy or Bordeaux; the taste is somewhat sour, a bit like grape juice with alcohol, but definitely pleasant. However, the areas wine potential hasn’t gone unnoticed by experts either. 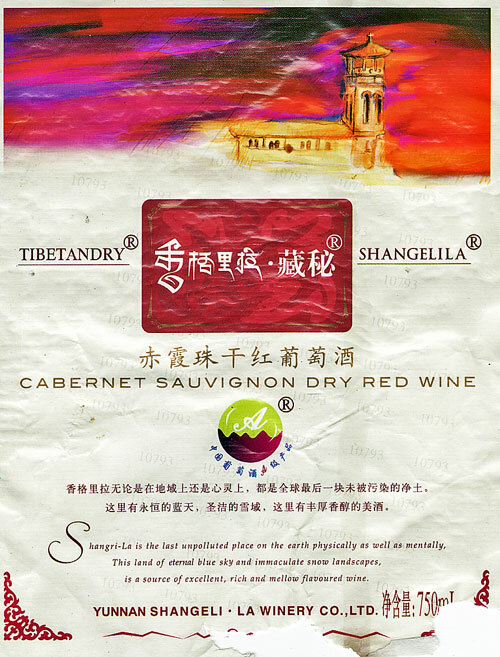 Recently one of Beijing’s largest wine companies, Jinliufu Wine C. Ltd., took over the Yunnan Shanglila Winery and invested large sums of money in developing what is now being marketed as Tibetan Dry Red Wine. 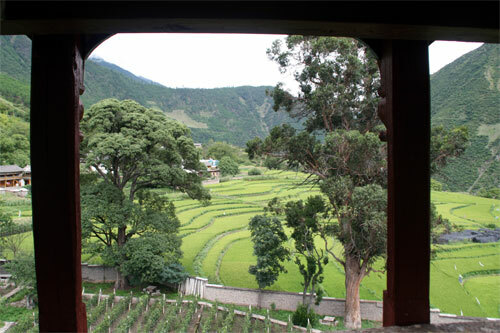 According to the company, the wine making process both incorporates the brewing techniques brought in by the French missionaries and the traditional methods of the Tibetans. The result is quite a decent red wine. It is much more refined than the cruder version sold in the houses in Cizhong, and for body, aroma and taste it can compete with many cheap Spanish and French reds. If you are in Zhongdian, don’t miss the opportunity to try it with the locally produced yak cheese at the Shangri-la Cheese Shop. 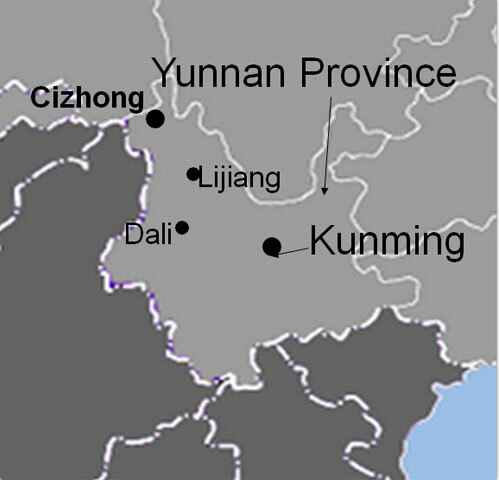 Cizhong belongs to a region undergoing a huge transformation. 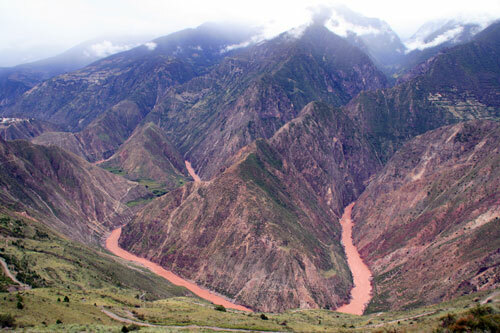 The isolated valleys of the Langcang and Nujiang rivers are becoming ever more accessible and inevitable changes are on the way. The label of Shangrila, imposed on the whole Zhongdian area by the Chinese Tourist Board, is already drawing increasing numbers of tourists to this environmentally and culturally delicate region. While undoubtedly a haven for hikers, trekkers and anybody genuinely interested in exploring nature, a destination for busloads of camera toting tourists it is not! On a different, but equally worrying note, it appears that some fundamentalist American Christian groups (often posing as English Teachers) are looking to open up this area and use it in their – religious – battle against the Chinese Government. While Cizhong and the surrounding areas cannot stop the world from intruding on their isolation, they deserve better than to be used as a proxy in a crazy religious war. 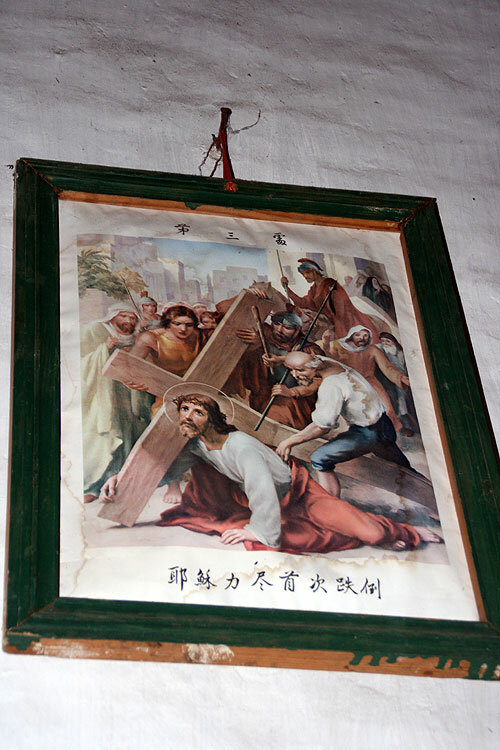 For more on Cizhong and Religion, go to the excellent blog: In the footsteps of Joseph Rock: Cizhong – A Christian Shangri La in Tibet – or the forefront of the next Cold War? A project to dam the Mekong river near Cizhong may in fact put an end to the village altogether. Read this article and Check in Deqin 德钦 or Feilai Si 飞来寺 before you go. Accommodation and Food: Our little walk around the village revealed at least 3 or 4 guesthouses, all with signs in English, such as the CiZhong Traveler’s Home, or the CiZhong Guesthouse. 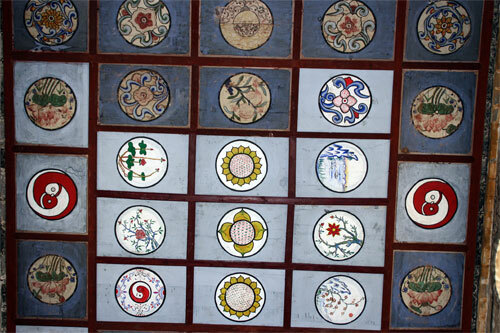 They are all located in sturdy Tibetan farmhouses and tend to sell wine as well. We had a very tasty Tibetan lunch in one of these places with, among other things, Tibetan bread, pickles, gourd and potato dishes and of course plenty of local wine. Transport: For convenience’ sake, we hired a jeep for 300 Yuan return from Feilai Si 飞来寺. However, getting there by public transport seemed relatively easy, as we saw plenty of buses plying the route between Deqin 德钦 and Weixi. These buses drop you off at the hanging bridge leading to Cizhong茨中, from where it’s an easy stroll into the village. From Weixi 维西 you can get a bus to Lijiang 丽江 (3 hours). If a dam has been built expect the journey to be far tamer than it was.